Delight wrens and nuthatches by providing them with the Heartwood Joy Box Wren, Titmouse, and Nuthatch House. 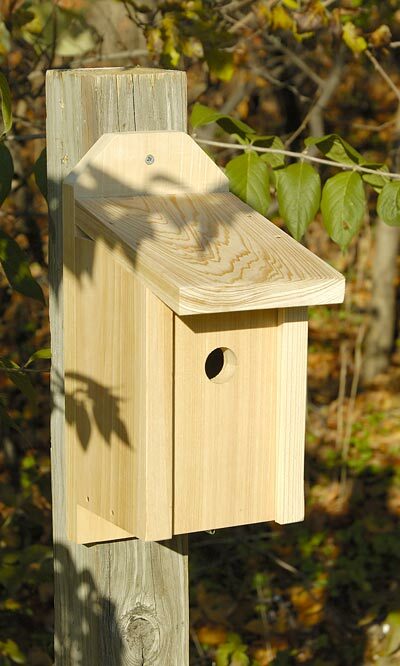 The clean design of this home caters to titmice and nuthatches, and provides a worry free roost for the beginning to experienced birder. The slanted roof has a significant overhang, to protect the 1.25" diameter entrance hole from moisture. Ventilation holes at the top of the frame help regulate the interior temperature, and gaps at the base of the piece act as drainage holes. A twist latch at the bottom of the home keeps predators out, while allowing regular nest checks. The front panel is easily inverted for winter use, keeping warmer air at the top of the home. Netting on the interior of the door acts as a ladder, aiding fledglings in exiting the nest. The 0.875" thick, solid cypress construction creates a well insulated home, while the natural color helps the item blend with its surroundings. Use the two predrilled holes on the back of the home to mount it to a post. Create a welcome roost for wrens, nuthatches, and titmice in your garden with this Joy Box Wren, Titmouse, and Nuthatch House. Made in the USA.